Michael Porter is Bankrupt AND the Framework of a Blindfolded Chimpanzee. Is Yammer doing better than Chatter? I recently put together a list of the largest Venture Capital deals thus far in 2012 based on Thomson Reuters. 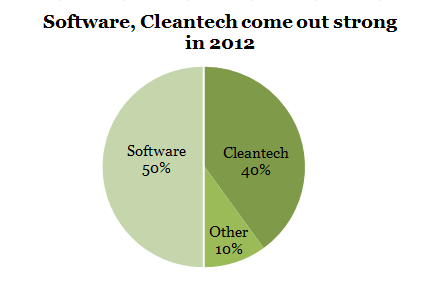 Although Software dominated the ranking of the biggest deals, Cleantech came out strong as well. Perhaps the most surprising aspect of the list is lack of representation of mobile start-ups. The unsurprising aspect, however, is unreasonable valuations of these companies — especially in the social media space. Here, Pinterest leads the pack by raising $100 million at a $1.5 billion valuation in May 2012. Not bad for a company with a revenue of about 9 million annually. Given my additional valuation analysis based on the DCF model reveals that under super generous assumptions the actual enterprise value is under 80 million! My [favorably unreasonable] assumptions included: EBIAT=Revenue, No deprecation charge, $0 in the capital investments e.g. computer hardware and office equipment, No taxes, No change in Net Working Capital, 17% WACC, and 8% in long-term growth. This reminds me of an article I read a while back, where SeekingAlpha looked at the massive valuations of social media companies and wondered if they are justified. The article quoted 2012 report by The Wall Street Journal, in which 20 internet start-ups were identified with a valuation over $1 billion. Topping the list were Airbnb and three other young businesses from my list below: Bloom Energy, Pinterest and Palantir. SeekingAlpha even went as far as to say that private investors (and VC firms) create the next dot-com bubble. It appears that the trend of bullish valuations based on the potential of the internet market rather than valuations based on fundamental data will likely continue into the foreseeable future. Agree, disagree? I want to hear from you!